the moosh got a new bike as a very belated birthday gift. But before I tell you the story of the new bike, I must first tell you the story of her umbrella. Indiana is also very windy and to make a long story short, a couple of weeks ago the moosh’s pink polka dot umbrella was violently blown from her grasp knocking her to the ground. Through screaming sobs she watched as her umbrella was blown across several soccer fields. I got her indoors with her preschool teacher and set out across the muddy goose terd laden field to get the $3.00 umbrella back. Oy, the things they don’t tell you about motherhood. She no longer uses her umbrella. She now hates the wind and with as much conviction as a three year old can have, she believes that the wind is out to get her. Which brings me back to the bike. For the first few days she had nothing against riding her bike endlessly around our neighborhood. So I was surprised when I told her we were going out to ride bikes on Friday and she broke down into hysterical sobs. As if something traumatic had happened on her bike but I had somehow missed it. Ah, life with a three year old. 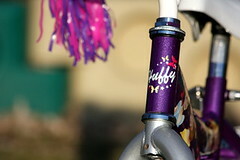 Then I noticed her clinging to her pink and purple handlebar tassels so hard her knuckles were turning white. If she hated riding her bike so much why did she insist on holding on to it? Then it hit me. Unfortunately the tassels couldn’t be removed without massive handlebar mutiltion. Rubber bands didn’t hold the tips of the tassels down to her satisfaction and tape would have ripped and stretched them. What was I to do? And then, in a flash that could only come to someone who has truly been tested in toddler crisis it came to me. Shoved in the back of our first aid kit was a roll of vet wrap that my sissy had given my years ago when our cat had surgery. And this is how I solved the bike flying away into the sky problem. You have one very adorable child! How’s it going with the weather there? Are there any floods near you? Krista’s last blog post..Mama Got a KitchenAid! Lol You’re a genius. Especially to even figure out she was afraid the wind was going to blow her and her bike away. Man, she couldn’t be cuter if she tried. I LOVED my tassels! They were pink and white. I have a little something for you. Mosey on over to my blog and scroll down a little. Kim’s last blog post..Get Your Blog On at the Ultimate Blog Party! That vet wrap is awesome! I think everyone household needs some. We could then have happy toddlers everywhere. Good idea. Hope your cankle is healing well! Very clever!!! Kudos to you for quick thinking!! Glad the moosh feels safe enough to go bike riding again!!! And, I’m an hour south of you- I’ve been trying in vain to convince the family that it’s time to build an ark. Glad things are better now! janet’s last blog post..Lawsie, Miss Scarlett, I don’t know NOTHIN’ ’bout birthin’ no babies!! feener’s last blog post..What are your thoughts ??? OOH nice fix! Isn’t it amazing what gets them all riled up? My oldest (age 7 mind you) is totally convinced that even though she’s grown adult teeth, they’re going to get all wiggly and fall out too. Some sort of wacky teeth ritual or something. Toni’s last blog post..Boys Will Be Boys…I Guess. Vet wrap is god’s gift. It also makes a perfect ace bandage. 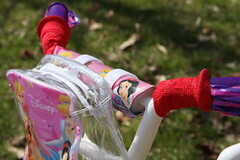 Love the princess bike too! Awesome! And, I know that “okay” you were talking about… It’s more of an “mmmmwwoookay” through sobs when it comes from my muffin. Hooray for saving the day!! See? NOW you can be inducted into that elite group of mothers – the ones that actually do have the answers (at least some of the time). Fantastic solution to the moosh’s problem. Carrie’s last blog post..Happy Easter! That was some quick thinking! Our little ones have very similar bikes, too! Come over for some princess bike riding sometime! Isn’t it so cute how they get some of these ideas about the world in their young minds? I know I shouldn’t laugh, but I had to when I read about her fear. It’s just so eerily familiar. My girls have had several moments like that when they’re convinced that the world is out to get them – one way or another. Sorry, but it’s so cute and so darn relatable. ps. you need an ark, I need a sled-dog! Smart move. I wish my bike was that cool. Ha, you think you need umbrellas, be thankful you don’t live in Seattle . Actually it’s been unseasonable sunny and we haven’t had much rain. Which in reality makes me think the world is going to end. Actually, the red tape was for me from when I nearly cut my finger off. Just thought I would point that mistake out since I cringe whenever I see that red tape. I’m here all the time. I’m so thankful you came to mooncookie long ago so I could discover the moosh in indy. This crazy internet / blog world is totally unfamiliar to me. You are a rock star. You know this. Thank you for your sweet comments or any comment at all. It gives me kick to know you have been around. No need to knock except when you are in the ‘hood. Just wanted you to know I feel I’m lost in a sea of fans so I rarely leave a comment. Moon Cookie’s last blog post..That’s My King! Good Job Super Moosh Mama!!! Good call! Toddlers make us realize things about ourselves we would have never known. 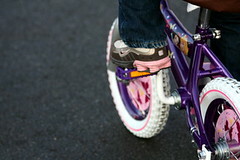 We just got our first bike too, a nearly identical huffy sans princesses and add a hefty dash of dora. It is so much better that you are the mom and not me. I would have still used the vet wrap, but I probably would have taped the child to the bike, or to a wall or something like that. Actually, I would have used duct tape, that will fix anything, and it’s shiny! Casey, you ROCK as a problem solving, on the spot Mom! So how was Easter? I love how kids think, partially because of how it keeps us as parents on our toes and keeps our minds from rusting. This story is too adorable. What a smart smart solution. I loved playing with vet wrap when I was a kid. We had a horse farm so it was everywhere. Isn’t it funny how the littlest things can really disturb children? But i’m totally with the Moosh, I can’t stand the wind either. It’s out to get me, or at least my hair. Ashley’s last blog post..What’s A Troll?